we don't agree with his sports teams, we can support his love of food. last 12 months Kevin was able to travel with and without his wife to Germany, Thailand, Japan, China, Prague, Austria, Budapest, and Austria. He attended a world series game where his team the Red Sox won in St. Louis. He lost 30 pounds while eating only Big G's and a little fasting. His favorite restaurant other than Big G's is Tango Sur - Argentinian Steakhouse on the Southport Corridor. His favorite slice is the buffalo chicken and bleu cheese pizza. Kevin has been a loyal fan since we opened our doors back in May of 2012 and has invited numerous friends and family members to enjoy our pizza. We thank you Kevin for being such a supportive Real G and we wish you an amazing December to finish out your year of triumph. of Tom Cruise in the movie Cocktail. Impressive! After many passing days, weeks, and months, our new Real G will finally get her recognition on our wall of fame. Clarissa never expected the title and effortlessly earned it after visiting us at Big G's over the last 12 months. Originally from Kansas City, Kansas, Clarissa moved to Chicago last year with her 4 year old and 7 year old daughters who are future Real G's in the making. Their favorite slices are naturally the Mac 'n' Cheese, but Clarissa is a die hard fan of our Savage pizza. Although she loves Chicago and all that it has to offer, she is a true and loyal fan to the Kansas City Chiefs. When Clarissa isn't busy being a Super Mom, you will see her hustling hard at Metro serving up drinks. Her favorite restaurant other than Big G's is Nelly's in Humboldt Park. She highly recommends the oatmeal, but says their entire Puerto Rican influenced menu is awesome. Among other recommendations Clarissa also enjoys Avondale and The Burlington on the rare occasion that she has some free time to herself. A lesser known secret about Clarissa is that she can't whistle, but her daughter is apparently a champion whistler among her friends. We can't thank Clarissa enough for all her support and enthusiasm that she has shown us. Thanks for always stopping in before work and making Big G's Pizza your go to restaurant. place. We hope you guys keep bringing the laughter to Big G's. July was an epic month for Chicago, and especially for us here at Big G's among the madness that took place in Wrigleyville. In between a weekend of concerts at Wrigley Field, over two dozen Cubs games at home against the Angels, the Cardinals, and the Brewers, 90 degree temps, rain storms, and trending sharknados on twitter one among them ruled them all. Our Real G of the Month, Vic. Vic has been a loyal supporter since back when Big G's was baby G. We had only been open a few weeks, when an authentic Manhattanite walked through our doors skeptical about our Mac 'n' Cheese pizza. For those of you who believe in love at first sight, his story will appeal to you. The first time he laid eyes on the Savage, he knew he had found a new home for pizza in Chicago, and a new favorite pizza. Aside from being a big fan of Big G's, Vic enjoys cooking quesadillas, chuletas, and even sometimes pizza (of course always using Big G's dough) at home. Vic's number one recommendation for a restaurant other than Big G's is Balé, a vietnamese restaurant north of Lakeview. When Vic isn't tirelessly working on his class assignments for courses he's taking at DePaul, he enjoys kicking back a few beers at Clark St Beach bar, or making investments. Vic we can't thank you enough for all your support this past year. We appreciate all the friends, peers, and strangers you have brainwashed into eating at Big G's. Your loyalty means a lot. We'll see you tomorrow...we're sure. Every month we will have the honor of naming a new REAL G. A REAL G is not something that anyone can request or apply for. 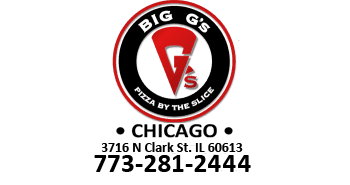 Each REAL G will get a Big G's t-shirt, a 12" pie of their favorite pizza, and the recognition on our web site, facebook and in-store on the wall of fame. Are you our next REAL G? A new month equals a new Real G! You might already recognize our new Real G this month if you hang around Wrigley Field when the Cubs are in town. Tom is out on Clark St. every game, selling parking just down the street from us. He is also an employee over at River Shannon where he does everything from bartending to checking ID's at the door. Tom is originally from North Carolina, and moved out to Chicago the day of the infamous Thunderstorm Blizzard of 2011. His favorite slice is our Sloppy Joe's Pizza. He enjoys going to musical festivals like the recent Spring Awakening at Soldier Field, and loves his country music. He is a big Chiver if you couldn't tell by his t-shirt, and is a big Panthers fan. You can catch him playing softball in Lincoln Park when he isn't busy working, and he likes to cook pasta at home every once in a while. Tom has been a fan of Big G's since we opened almost 14 months ago, and visits 2 sometimes 3 times a day. One memory that stands out above the rest in regards to his undying love for Big G's was on a cold day in January. He stopped in with about 4 of his friends who decided that 10 min was too long to wait for the fresh pizza they wanted. Instead they all walked further north for some sandwiches. All of them, except Tom. Tom decided he would wait and by the time he got his pizza his friends were just finishing getting their food too. Thanks for all your support and loyalty. We are glad to give you the title of Real G.
The man in the slick sunglasses is none other than our dear friend Adam The newest member of the Real G family. It was no surprise to our staff, but Adam was definitely caught off guard with the recognition. Adam is one of our more unique Real G's because every time we have a two week special or a special of the week he is always excited to give it a try. His favorite slice is still the Savage, but without any question he has tried almost every kind of pizza on our menu and on our special of the week roster more than any other customer. Originally from Williamsburg, Virginia, Adam majored in hotel hospitality and service. He loves watching football and grew up a Vikings fan. When they aren't going head to head with the Bears, he supports our team too. Later this year he plans on taking a trip to Ireland with a few friends and hopes to tell everyone about Big G's Pizza and our famous ranch. This man is a Real G, and we want to thank him for all his support. Thanks Big Guy! This month marks an incredible milestone for Big G's Pizza. This month we have the honor of presenting our 12th Real G! Christine has demonstrated great patience this past year and after many consecutive months as the mayor of Big G's on Foursquare we were more than happy to give her the title she deserves. Christine is originally from Wheaton, IL and a great lover of Chicago sports. She is such a big fan of our sports teams you are very likely to find her at every game in almost every sport. No joke! She attends Cubs, Sox, Bulls, and Blackhawks games selling the 50/50 raffle tickets at every home game. Christine has been a BIG ambassador for Big G's, by consistently bringing friends and co-workers to try our pizza. When she isn't busy at work she loves watching episodes of the Walking Dead or Glee and her favorite movie is Mean Girls. She also enjoys playing video games but one of her major accomplishments this year is her commitment to a healthy lifestyle. This past year she lost 60 lbs. by participating in the Insanity program. She is working towards becoming a personal trainer and we wish her the best of luck with her goals. Thank you for all your support Christine! Our Real G of the month is no stranger to competition or achieving greatness. Kelly (not Lindsay--inside joke) is a former Luvabull and a current employee for the Cubs who has been competing all her life. While at Notre Dame High she played volleyball, softball, and gymnastics. Originally from the north side of Chicago, Kelly has been a Cubs fan all her life, as well as a Bulls and Bears fan. We learned a few things talking to Kelly. Her favorite movie is "Drop Dead Fred," and claims she can recite every line in the movie. She loves NKOTB (New Kids On The Block for those of you unfamiliar with the acronym), and has gone and will go to the reunion concert, where they will be accompanied by 98 degrees and Boyz II Men. For fun she likes to go bowling, tell her co-workers and bosses, "That's what she said..." jokes, and at one point was known for being a big fan of clubbing. Kelly is a cool customer, funny, and a BIG fan of Big G's. But most importantly, she is an awesome mother of four who can juggle her busy life all while earning the title of Real G. Thank you Kelly for all your support and great attitude even when we call you by the wrong name. If only all moms were as bad a** as you! And of course her favorite slice is The Savage. What a champ. Judging by the picture you can very well assume that winter is not behind us quite yet. Luke is donning a winter coat with a hoodie letting all of Chicagoland know that winter is not over yet. Luke "The Savage" is a Real G like no other. You might see Luke all over the streets of Chicago in his car delivering food from numerous restaurants. After a long day on the grind and building up an appetite he'll give us a quick call letting us know he'll be stopping in for his regular order (a slice of the savage and a cherry coke). Luke "The Savage" means business. Besides showing great enthusiasm for the Savage pizza he has been a great promoter of our establishment. From posting a review on Yelp many months ago to introducing his sister to our establishment he has done everything possible to earn the title of Real G without ever expecting it. His patience finally paid off when we told him that he was our next Real G. Luke is aspiring to be an engineer and we wish him the best with all his endeavours. Thanks for all your support Luke! What's up Big G's fanatics?! A new month is upon us which in our world means a new Real G is getting the spotlight. We introduce to you our good friend Kirby. Kirby is an Illinois native, with many surprises. The first being that he majored in opera! Although he eats enough of our pizza that he should look a lot more like Pavoratti he only sings like the master, or so we believe since we haven't had the good fortune of hearing his skills. Early into his major Kirby realized that the opera hustle was a lot greater than imagined so he decided to become an entrepeneur much like ourselves. Kirby started his own LED light bulb company for street lights. You might find them around the city in a few gas stations but most of his contributions are located in our neighboring state of Wisconsin. We definitely applaud his efforts in making our community more eco friendly, and it's a great pleasure to give someone as wholesome as Kirby the honor of Real G this month. Thank you Kirby for all your support and bringing new faces to our establishment week in and week out. We appreciate it in a BIG way! As more customers walk through our doors we always imagine that it will get harder and harder to pinpoint the customer who is worthy of our REAL G title. This last month was a blowout. Meet our good friend JEAN-RIVE NDJEMBI from the country of Gabon. For those of you who are geographically challenged Gabon is in Africa. Jean is a 28 year old student studying to be a chemical engineer. He is the youngest of nine siblings, knows how to play the drums, and speaks French fluently as well as three other dialects. His English is impressive too, but his most revered talent is his ability to dance, specifically to R&B/Hip-Hop music. When Jean isn't busy tearing up the dance floor at local clubs and touring with a famous local celebrity, he is spreading the love of Big G's. Even though Jean visits enough times in a day/week/month to earn the title of REAL G on his own, his loyalty doesn't end there. He brings in new customers through our doors by the dozens. For that we can't thank Jean enough. He is THE MAN! Jean has tried nearly every type of pizza we have on our menu, but his favorite is the savage. If you are looking to see Jean's impressive dance skills you might find him at Sound Bar clubbin on the weekends, or Bootlegger's for a drink. Jean is very easy to find. He is always the best dressed person wherever he goes. The man has style. Jean, thanks for all your support! See you later...today, I am sure. Dan "The Savage" Wolfe is how we refer to our new Real G of the Month for November. Dan hails from the far away land of Dublin, Ireland. Some fascinating facts we learned about Dan is that he was the cycling champion in every age group back at home before coming to the U.S. At the age of 24 Dan enjoys biking down lakeshore path when it's less busy. His favorite late night spot in Chicago is Big City Tap for the sole reason that they are open til 4 or 5 am. He wasn't exactly sure of the time they close because he has a foggy memory around that time of day. One of Dan's most impressive accomplishments from what we have observed is that every time he visits us, and he visits quite often, is that he orders 3 slices of "The Savage Pizza" and eats them all in one sitting. When we offered Dan the title of Real G his humble reaction was very heartwarming, but what made the moment memorable was him saying, "I've never been addicted to anything in my life. I will miss the Savage when I go back home in January." We will miss your late night visits and your addiction to the Savage as well Dan. Thanks for all your support and bringing all your friends to Big G's. Stacks! On Stacks! On Stacks! of pizza boxes is what you might find at Erik's crib. An Ohio State graduate, Erik is no stranger to partying or pizza. Originally from Buffalo, New York, Erik is a fan of the Knicks and is from a part of the state that makes him a Mets fan. After college he found a home in wrigleyville for the last year while earning a living conducting third party logisitcs...huh?...international shipping...ah. Anyways, Erik is also a self titled Law & Order buff and enjoys listening to classic rock. When we asked Erik what are some of his favorite places to check out in Chicago his response couldn't have been more appropriate, "Well aside from Big G's..." followed by North Ave. Beach. He also hopes to one day learn how to play the harmonica but in the mean time he'll be busy eating his favorite pizza from Big G's, the Jack Daniel's BBQ Pulled Pork. Thank you Erik for all your support for the last 6 months. You have been a Real G to the core. With great enthusiasm you have brought in all your roommates, friends, and strangers off the street just to get a peek of our delicious pizza. We even remember the time you brought in some local neighbor's dog to share the love around 3AM on a Friday night. Remember? We do. J.K.
We get a lot of questions about what it takes to be a Real G Of The Month and typically our answer is that our featured G's come in practically every day and sometimes twice a day. In this case we have a rare exception to our featured Real G this month. We introduce Mr. Grossinger, a man who in many circles needs no introduction. The name may seem familiar if you have ever noticed on the back of many vehicles in Chicagoland with a stamp of his family name. Mr. Grossinger and his family have been in the car sales business for 90 years. Originally from Lincolnwood, Mr. Grossinger is naturally a Bears fan, and majored in finance at the University of Wisconsin-Madison and DePaul University. His favorite slice is our Mac 'N' Cheese Pizza. This past summer Mr. Grossinger gave us the honor of catering his annual Air & Water Show Party for his employees and their families (over 400 people). Since then many of his guests have stopped in to get more of that delicious pizza they remember so well from that sunny afternoon looking up at the sky. When Mr. Grossinger isn't sharing the love of pizza with those close to him he enjoys fishing. He is also a family man with two sons who also enjoy our pizza almost as much as he does. We thank you Mr. Grossinger for thinking of us for your catering needs, and we look forward to exceeding your expectations in the future as always. What up party people?! Allow us to introduce to you Evan Schreiber. Originally from the west coast, Evan has proven himself worthy of the title envied by many as our Real G of the month. Evan went to Northwestern, and that makes him a pretty smart guy. So its no surprise to us that he probably figured out in very little time that if he was going to earn the title he would have to live nearby. Coincidentally he lives across the street. He claims he was already living there before we opened but we believe he used his street smarts and college education to get the needed leverage to ensure the title. Sadly, Evan will be moving to a different part of the city relatively soon. Although your Lakers gear and west coast swag will not be missed, we want you to know that Big G's is going to start a Big 10 rewards program. If your wildcats win a Saturday football game we will give you a free beverage of your choice with the purchase of any 2 slices. This same reward holds true for any alum of any Big 10 school. Big G's is all about the BIG 10. Just show up in your BIG 10 gear on the day of the game and claim your reward! Thanks for all the support Evan! Ladies and Gentleman we introduce to you the Irish, as we refer to them here at Big G's Pizza. Although we strongly believe they need no introduction. If you live, work, or party in Wrigleyville you know who we are talking about. The Irish, who are actually from Ireland, have taken over Lakeview this summer and without any question have been great supporters of Big G's. A few of the Irish stick to the traditional Cheese or Pepperoni, but we believe that almost 99% of them love and only eat our Savage Pizza. The Irish just can't get enough of it, but if there is anything they love more than the Savage it would have to be our Big G's Ranch, also known among the Irish as Garlic Sauce. They go nuts for it. They love our ranch so much they put ranch on top of their ranch! Seriously. Since we can't afford to give all 2000 of the Irish visitors t-shirts and 12" pizzas for being our Real G's of the month we threw them a party and oh man do they know how to party. They took full advantage of our BYOB policy which made the whole party all the more entertaining. We really appreciate all your support and we hope you had as much fun in Chicago as we had seeing you guys eat our delicious pizza every night of the week at 4AM. Go IRISH! This past month the competition for the Real G of the month was fierce. The decision was so difficult that we went against our better judgement and allowed two contenders to take the title. Meet Max and Tad for no other reason other than we had to...every day...for the past month. These guys stopped in every single day and in most cases twice a day. It doesn't hurt that they live around the corner, and thanks to these guys the word is out about Big G's, especially considering that they're always bringing new visitors with each visit. They are both born and raised in Chi-town and are studying film in Colombia and DePaul respectively. Their favorite pizza at Big G's is the Philly Cheesesteak. After chatting it up with Max we learned that at one point he had the opportunity to live in Cali, and when asked if he came across any cool pizza joints on the west coast he said, "No. Pizza in Cali is wack." We'll take his word for it. Tad is also a travelling man. Aside from being a Big G's fanatic he also enjoys music festivals and going cross country to listen to his favorite jam bands and blue grass artists. When he isn't busy being a groupie you can find him on the basketball court shooting the rock and dunking over 5 year olds. We couldn't have said it better. These guys are clearly this generation's Socrates and Aristotle. Thank you guys for all your support, and if you can squeeze in some volunteer work in between classes, come film Big G's first commercial! Both Tad and Max say their favorite pizza is the Philly Cheesesteak. Meet REAL G Rona J., a Lakeview local that has been building street credit at Big G's like nobody's business. An alum of Michigan State, she undoubtedly brings the Big 10 enthusiasm with every visit. When she isn't banging the drums at home you might find her sitting comfortably behind home plate enjoying a Cub's game. Rona recently celebrated her birthday Memorial Day Weekend and sure enough graced us with her presence on her special day. And although she may not remember it, we certainly did. Thank you Rona for all your support and for bringing friends, co-workers, and family with each visit. You have set the bar high for what it means to be a REAL G.
Rona's favorite slice is the Peruana (Portobella Mushrooms, Sweet Red Peppers, and Crumbled Feta).